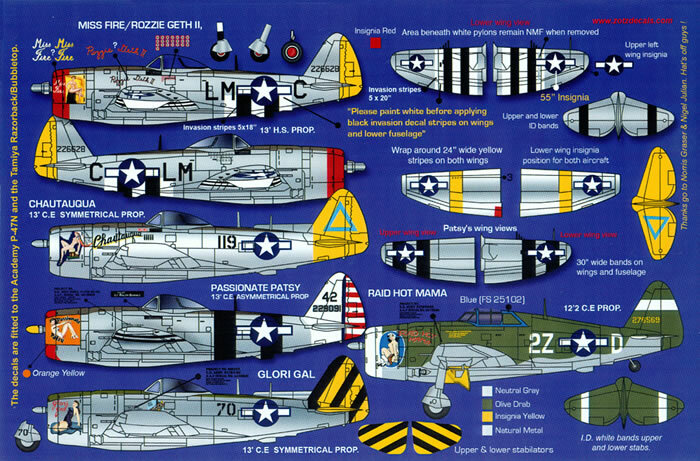 48/036 is the second of the four new 1/48 scale sheets from Zotz Decals covering colourful P-47 Thunderbolts. ‘Miss Fire/Rozzie Geth II’ P-47D-25-RE serial number 42-26628 flown by Captain Fred Christensen Jr. of the 62nd Fighter Squadron, 56th Fighter Group. The aircraft is in natural metal finish with olive drab anti-glare panels (fore and aft the cockpit) and sports a red cowling front and a yellow rudder. Black and white D-Day identification markings are worn on the underside of the wings as well as the rear fuselage. The black portions of the D-day markings are provided as decals but you will have to paint the white yourself. ‘Chautaugua’, P-47N-2-RE, serial number 44-88259, of the 20th Air Force’s 463rd Fighter Squadron, 507th Fighter Group, flown by Lieutenant Victor Schmidt from Ie Shima, in 1945. The aircraft is in natural metal finish with olive drab anti-glare panels and sports the all yellow empennage Group marking with the blue triangles squadron markings. It also wears yellow bands around its wings but these are not provided as decals so you will have to paint them on yourself. ‘Passionate Patsy’, P-47D-28-RE, serial number 42-29091, of the 310th Fighter Squadron, 58th Fighter Group. Flown by a Lieutenant Barns from le Shima in 1945. The aircraft is in natural metal finish with olive drab anti-glare panels with a white empennage (a hold over from the Group’s earlier time when based in the New Guinea area and wore white empennage and wing leading edge identity markings) as well as the pre-war style blue bordered red and white striped rudder as well as a scalloped red cowling front and an orange/yellow rectangle that bears the nose art. The machine also wears the Pacific Theatre black bands on the fuselage and wings and these are provided as decals. I also liked the fact that the serial number is provided on a silver back ground to simulate the serial being masked over when the white was sprayed on the tail. ‘Glori Gal’ P-47N-2-RE (?) (with an unknown serial number), 7th Air Force, 19th Fighter Squadron, 318th Fighter Group aircraft based on le Shima in 1945. In overall natural metal finish with olive drab anti-glare panels and medium blue trim to the cowling and cowl flaps. The fin, rudder and horizontal stabiliser/elevator wear the bold yellow and black striped post June 1945 group markings. The black stripes of the group markings are provided as decals which will ease the task of masking considerably. ‘Raid Hot Mama', P-47D-20-RE, serial number 42-6569, of the 9th Air Force’s 510th Fighter Squadron, 405th Fighter Group flown by a Lieutenant John Drummond in 1944. A European Theatre aircraft it wears olive drab over neutral grey camouflage along with the that theatre’s early recognition markings consisting of white front to its cowling and bands over the wings and vertical and horizontal stabilisers. 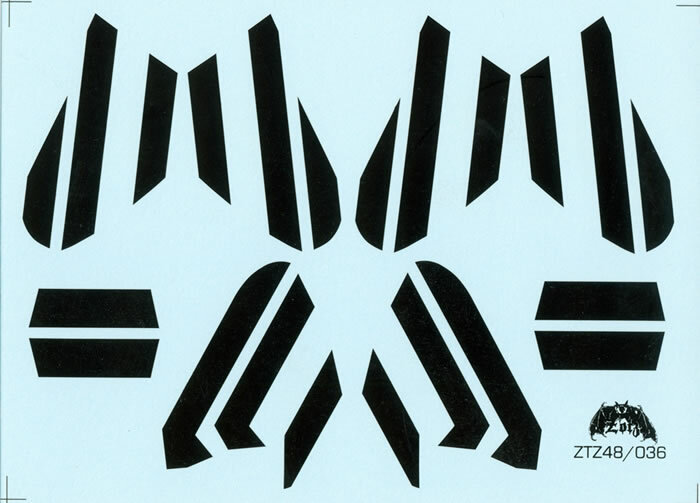 The wing and tail bands are provided as decals to save you the tasking of masking. 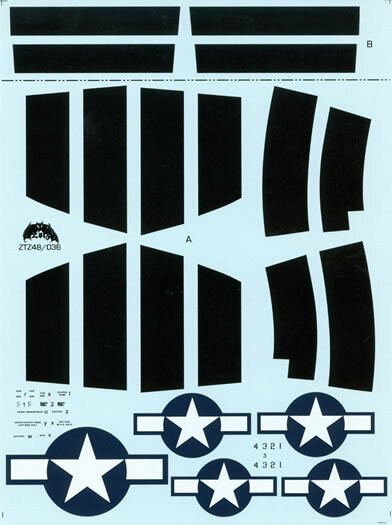 As with the other 1/48 scale Zotz P-47 sheets, the placement guide is a simple half A-4 size piece of thick paper that shows colour profiles of each option with (very limited) information for each option. There is no advice as to who has produced the decals but they are really well printed with the nose art being rendered with shadowing and shading – very well done indeed. The decals are thinly printed and have an absolute minimum of film surrounding each individual item. You get a single set of national insignia (including the larger one worn on the bottom of the port wing as an added identification marking in the European theatre) as well as a single set of stencil data although each option – bar ‘Glori Gal’ – has its own individual data block with the correct serial. A single set of 318th Fighter Group tail markings is provided too as are a single set of black theatre bands for the “Passionate Patty” option and a set of black-only D-Day stripes. The decals and the placement guides come packed in a clear plastic zip-loc bag. This is another excellent release from Zotz in their P-47 series. It provides some really colourful good quality markings for two European and three Pacific based machines. However, I can’t help thinking that it would have been even better if more information of the subjects were provided.